Published on 13 September 2012. This is a drum clock manufactured by Potts for the concourse at Newcastle Station, where it still hangs today. It’s about 120 years old or thereabouts. For a long time after I first moved to Newcastle, this clock had no hands. I don’t know whether it was broken and later repaired, or whether the hands were removed for restoration. But after what seemed like years of it being a broken clock, I remember being somewhat surprised to find it in full working order one day. 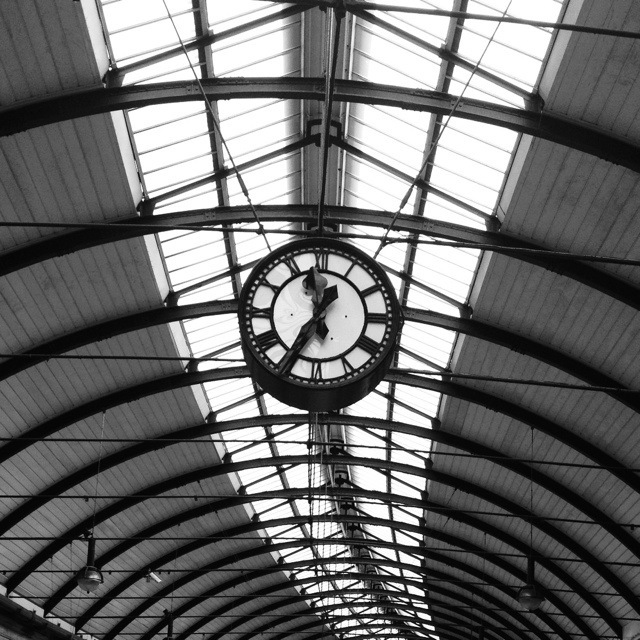 One of the more widely circulated pictures from the large storms that have battered Tyneside in the last few months is this shot of the very same clock, in which the roof of the station is leaking to such a degree that it looks like it’s raining inside! This 1,808th post was filed under: Photo-a-day 2012, Newcastle-upon-Tyne. Comment posted at 23:13 on 7th October 2012. Very interesting photo and comment. The only aspect of the restoration is that the design of the original hands wasn’t used when the new hands were made. All Victorian clock-makers were known principally by the design of the hands, particularly when the name of the firm making the clock wasn’t shown on the dial. From old postcards it looks as though the words “Potts & Sons” and “Leeds” were painted on the dials when the clocks were installed. Comment posted at 16:30 on 10th October 2012. That’s interesting – I wonder what happened to the original hands? I can’t imagine them just falling off, but if they were intentionally removed, it seems odd that they were lost. I wonder why they didn’t use the original design in the restoration? I suppose it could be a cost issue, but then I’d have thought that clock hands like this would have to be bespoke anyway, so where’s the advantage in making them different?